Search the WInvertebrates web site using Google. This web site is a work in progress dedicated to the aggregation and synthesis of information about the freshwater invertebrates of Wisconsin, USA. 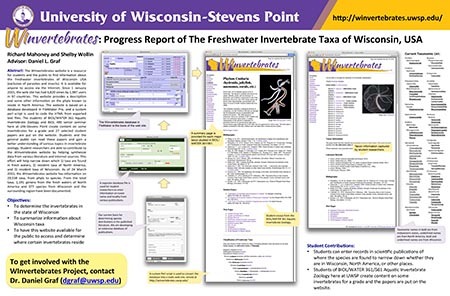 This site is managed by Dr. Daniel L. Graf of the University of Wisconsin-Stevens Point as a resource for students of BIOL/WATR 361/561 Aquatic Invertebrate Zoology, BIOL 490 Senior Seminar: Freshwater Invertebrates, other UWSP courses, and anyone else that might be interested. Site content is developed by Dr. Graf and includes contributed student essays. Copyright for all original essays is maintained by the authors. Click here for an explanation of the database and web site structure. Click here to see a list of contributors to this site. Again, this is a work in progress. The goal for 2012 was to generate a synthesis of all freshwater invertebrate families and genera occurring in North America (exclusive of insects and parasites). This was accomplished by verifying all the taxa (down to genus) listed in both Smith (2001; Pennak's Freshwater Invertebrates of the United States) and Thorp & Covich (2010; Ecology and Classification of North American Freshwater Invertebrates). These references were checked against the relevant articles from the 2008 Freshwater Animal Diversity Assessment published in Hydrobiologia, as well as various biodiversity web sites (e.g., World Register of Marine Species, Wikispecies, Animal Diversity Web, Integrated Taxonomic Information System, Wikipedia). The references are fully cited (and hyperlinked) in the various taxon accounts. For 2013 and 2014, the goal was to refine the list for North America to emphasize those taxa that are found in the state of Wisconsin, and we made some progress with that. We will stick with that objective in 2015 and continue developing a catalog of global freshwater invertebrates as a scaffold for the taxonomy of Wisconsin taxa. UWSP students Richard Mahoney and Shelby Wollin presented a poster on student contributions to the WInvertebrates project. Click here to learn more.